A flag pole is also referred to as a flagpole, flagstaff, or simply a staff and is defined as a a tall staff or pole on which flags are raised or supported. Flag poles are usually made from made of wood or metal. To raise flags, a cord is used, looping around a pulley at the top of the flagpole with the ends tied at the bottom. Flags are fixed to the lower end of the cord and raised by pulling the cord on the other end. The cord is then tightened and tied to the flagpole at the bottom. 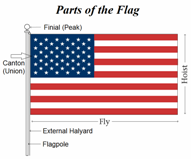 The 'External halyard' is the name given to the rope or cord system for raising and lowering flags that are located on outside of flagpoles. The 'internal halyard' is a rope, cord or cable system located on the inside of a flagpole for raising and lowering ensigns. They should be hoisted briskly and lowered cautiously. Flagpoles are often decorated with a 'Finial' such as a decorative ball or eagle and used to decorate the top of flagpoles. Fact 4: When flags are flown from adjacent flagpoles, flags of the United States should be hoisted first and lowered last. Fact 5: All flags should be raised and lowered by hand via the flag pole. 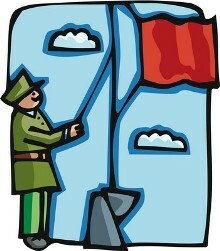 Fact 6: The edge positioned toward the flag pole is the heraldic dexter or right edge. The sizes of flags are determined by the exposed height of the flagpole from which it is flying and ensigns must be in proper proportion to its flagpole. It is therefore extremely important to check flagpoles with the sizes of flags. Flags which fly from angled poles on homes and those which are displayed on standing poles in offices and other indoor displays are usually either 3 feet x 5 feet or 4 feet x 6 feet.